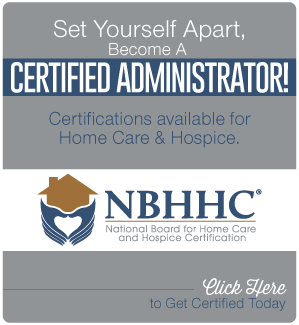 The goal of the Home Care Administrator Certificate Program (HCACP®) is to provide a supportive learning environment to you, as a home care administrator. You will be able to advance your skills and knowledge base to position your organization to prosper in the rapidly changing health care environment and to incorporate the complexities of quality, compliance, financial and strategic performance. This program pertains to Medicare certified agencies only. LEGAL: Focuses on legal/compliance management to help you integrate quality, compliance and financial strategies appropriately and successfully. FINANCE: Focuses on financial management principals and the integration of these principles with clinical management. STRATEGY: Focuses on vision driven leadership and performance management strategies to position your organization for success. Identify key health care trends that will influence positioning strategies for your home care organization. Integrate data management and analysis methods into your quality assessment and performance improvement program. Implement key financial management strategies to prepare and interpret financial documents and to understand the impact of current changes in health care. Understand the importance of various accounting methods to improve agency performance and position for success. Understand leadership responsibilities in promoting a quality driven organization. Integrate corporate compliance issues with clinical, financial and legal integrity of the organization. Sheryl Jones is the Director of Product Services at Corridor. Corridor is a leading home health, hospice and private duty consulting firm that provides consulting, coding, revenue cycle management and education services. Ms. Jones' 42 years tenure in healthcare has involved multiple roles in hospitals, pharmaceutical sales, home health/hospice/DME/infusion therapy services and home health and hospice consulting. Her passion in her work is for "quality patient care" by helping providers improve their organizational performance. This is accomplished by developing the most comprehensive resources and tools that agencies can use to ensure regulatory requirements are met. Sheryl has spoken at national, regional and local conferences/webinars on topics related to quality performance and improvement and other regulatory topics such as HIPAA and Corporate Compliance. Ms. Jones holds an undergraduate degree in Medical Dietetics from the University of Missouri � Columbia and a Masters of Business Administration from the University of Central Missouri. Christine Lang is a Senior Director of Product Management at ABILITY Network, a leading healthcare information company helping providers simplify administrative and clinical complexities of healthcare through innovative applications and analytics. Ms. Lang currently leads product design and healthcare analytics for the company’s home health and hospice performance reporting products. Ms. Lang’s 20 years’ tenure in post-acute data analysis has involved multiple roles, including client services, data consulting, product development, and business strategy. Her two biggest passions in her work are 1) helping providers improve their organizational performance through the use of information; and 2) using data to advocate for the value and importance of post-acute providers. She achieves both through frequent publishing and speaking at conferences. Ms. Lang holds an undergraduate degree in Political Science and Mathematics and a Masters of Business Administration from the University of Washington. Mr. Sharp is BKD’s Home Care & Hospice Center of Excellence Coordinator and has more than 20 years of experience assisting home care and hospice providers with audits, strategic planning, accounting, cost reports, projections, operating budgets, corporate integrity, agency start-up and mergers and acquisitions. Mark frequently presents workshops on various home care and hospice topics at national, regional and state home care and hospice conferences throughout the United States. He has written numerous articles in health care periodicals and is routinely quoted in home care and hospice newsletters. He is a member of the Home Care & Hospice Financial Managers Association’s (HHFMA) Advisory Board and currently chairs its Payment and Reimbursement Committee. Karen has nearly 15 years of experience with BKD providing clinical and operations consulting services to home care and hospice agencies to help establish and maintain quality and cost efficient practices. She provides operations assessments, outcomesbased care management strategies and training, assessment and implementation of productivity and compensation models. Karen frequently consults with providers and legal counsel on compliance matters, including assisting providers with compliance audits related to program integrity contractors, and she is experienced in planning and facilitating Independent Review Organization audits required by providers subject to Corporate Integrity Agreements with the Office of Inspector General. Karen’s home care experience began in 1981 as a practicing registered occupational therapist and moving on to roles as clinical and regulatory manager. 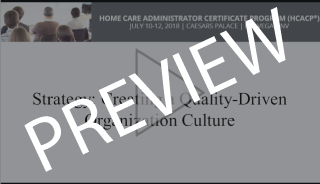 As a home care agency regulatory manager, Karen was integrally involved in preparation of the Medicare home health Outcome and Assessment Information Set (OASIS) implementation and prospective payment system. Her OASIS experience began as part of the demonstration project in the 1990s and continued with the original Centers for Medicare & Medicaid Services (CMS)/Center for Health Services Research Trainthe-Trainer Program, agency implementation and years of training at the agency, state and national levels. Recognized for her national presence and clinical expertise in home care and hospice operations, Karen serves as liaison to the Joint Commission Home Care Professional Technical Advisory Committee, the Missouri Alliance for Home Care Research and Education Foundation Board, and the Home Health Professional Advisory Committee to the American Occupational Therapy Association (AOTA). She has also served on the 2016 IMPACT Act Home Health Focus Group, the 2007 and 2010 Technical Expert Panel for CMS’ Home Health Quality Improvement Campaign and the Agency for Healthcare Research and Quality and Consumer Assessment of Healthcare Providers and Systems. Karen routinely presents for numerous national and state organizations, including the National Association for Home Care & Hospice (NAHC), AOTA, American Physical Therapy Association, many state and regional associations and several national media organizations. She is the editor of Home Health Care: A Guide for Occupational Therapy Practice, published in 2016. Karen is a 1978 graduate of University of Missouri, Columbia, with a B.S. degree in occupational therapy. Ms. LaPlante counsels a range of health care providers, including home health and hospice providers, in fraud and abuse and other compliance matters. Specifically, Dayna works closely with clients to navigate and resolve civil and criminal government investigations as well as internal compliance investigations. Should litigation arise with government or private parties, Dayna also represents clients throughout the pendency of a case until resolution. Dayna is a member of Polsinelli PC's national Health Care Group and Government Investigations Group, and is currently an associate out of the firm's Chicago office. The On-Demand HCACP® comes with a three (3) month subscription to the content. This program is designed to be completed within the designated subscription length. However, we understand that circumstances arise that may prevent timely completion. If additional time is required to complete your program, extensions can be purchased in two week increments for $100 each. Extensions must be requested in writing to the CAHSAH registrar prior to your original subscription expiration date. There cannot be any lapse in enrollment between original subscription and extensions. No exceptions will be made to this policy.